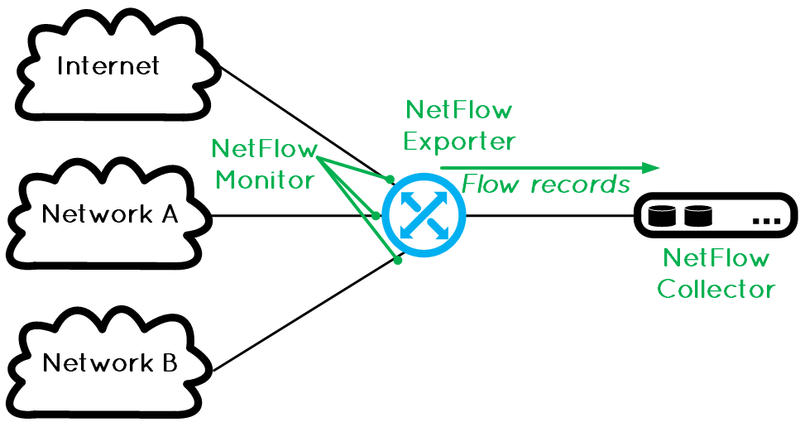 GUI vs CLI: Which for Managing Network Switch? Network switch is the major building block of many business networks, as they connect multiple PCs, printers, access points, servers, and other hardware to make your business up and running. Switches enables you to send and receive information and access shared resources in a smooth, efficient and highly secure way. It happens at some points we need to make settings or adjustments on switches to perform certain function, like configuring VLAN or check status of switch ports. 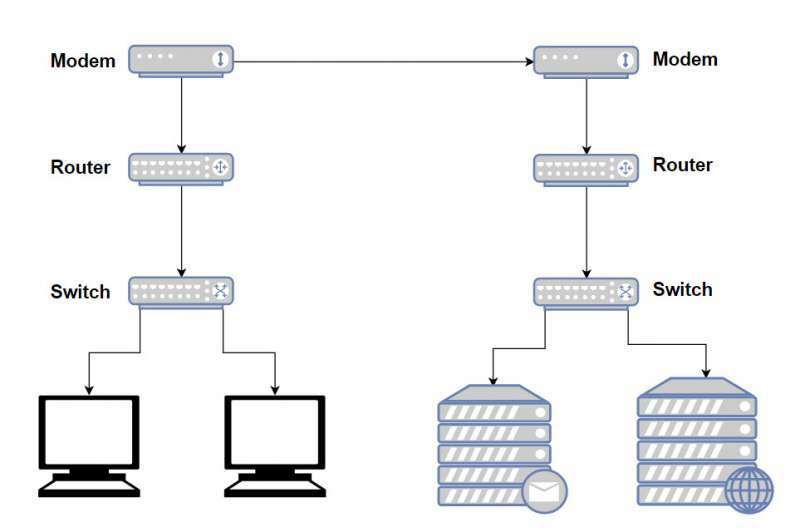 So how to get the configuration access to a network switch? Does GUI or CLI work better for you? What’s the difference between GUI vs CLI? We’ll address these issues and guide you to manage switch via GUI and CLI. GUI is short for Graphical User Interface – it uses graphics like windows, scrollbars, buttons, etc. to allow users to communicate with the data switch or GUI operating system. It facilitate users, especially novice users in an intuitive and easy-to-learn way. GUI access need recognition and good exploratory analysis and graphics, which is more suitable for users who requires no access to advanced tasks. What Is CLI (Command Line Interface)? CLI stands for Command Line Interface, which allows users to write commands in a terminal or console window to communicate with an operating system. CLI acts as the medium between operators and the network switch: Users have to type command to perform a task. CLI is more accurate than GUI, but it has a very steep learning curve. CLI is appropriate for users who uses it in a regular basis, or for the costly computing where input precision is the priority. GUI vs CLI: What Is the Difference? Ease of Use: CLI enable users to type manual command in order to perform the desired task whereas in GUI users provided visuals to communicate with the data switch. So the beginners will pick up a GUI much faster than a CLI. Control: With a GUI, there’s control over files and the operating system – but advanced tasks may still need CLI. While CLI enables all the control over file system and operating system, making tasks simple. Speed: In GUI, using the mouse and the keyboard to control is slower than using the command line. With CLI, the operator simply use the keyboard and may need to execute only few commands to complete the task. Hacking: In terms of hacking, all the vulnerability exploits are done from command line. 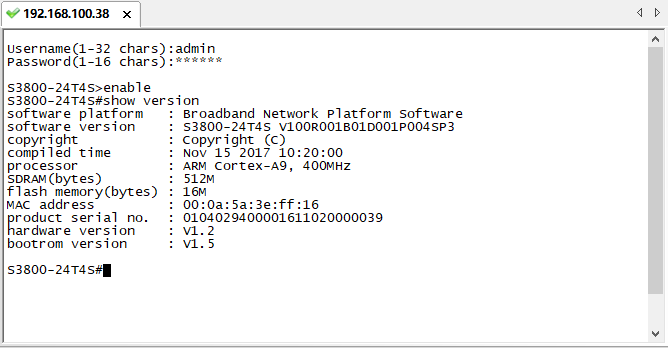 All the remote access and file manipulation are done from the command line. Scripting: CLI excels in this field since it allows you to create a script that contains few lines of command and it will do the work for you. Here we use the chart to summarize GUI vs CLI differences. Command line interface enables a user to communicate with the system through commands. Graphical User interface permits a user to interact with the system by using graphics which includes images, icons, etc. Hard to perform an operation and require expertise. Easy to perform tasks and does not require expertise. GUI vs CLI: How to Use Them to Manage Network Switch? 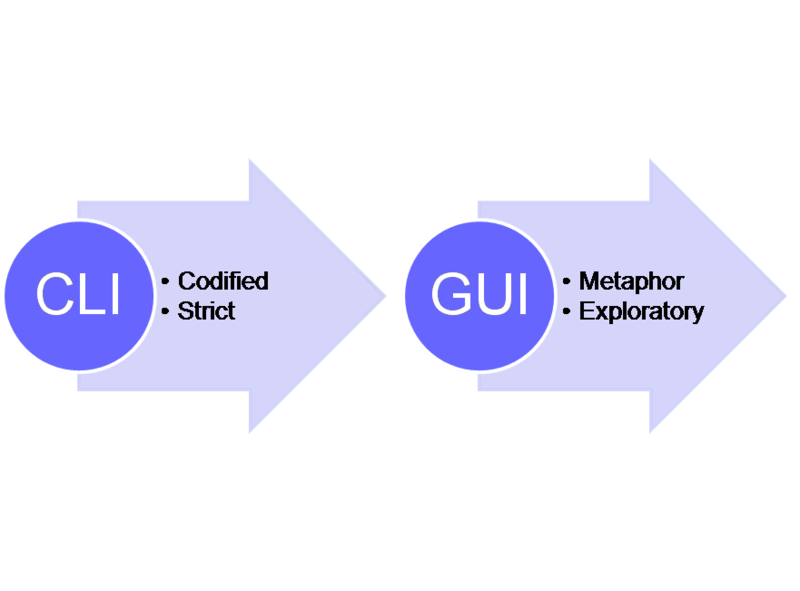 CLI and GUI are different kinds of user interfaces with their own merits and drawbacks. It is important to understand where each one excels so you can pick the right tool. Using the defining features of two different tools provides the best of both worlds. 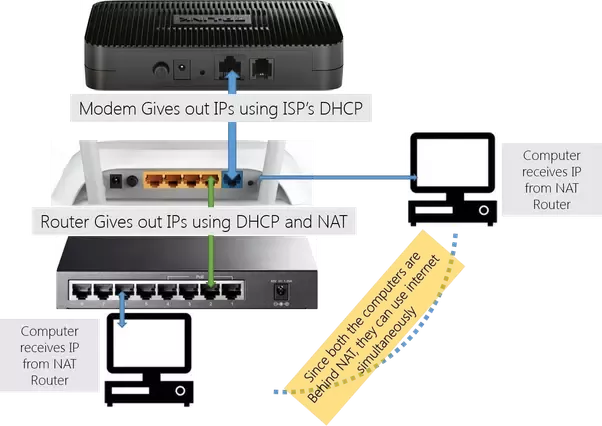 The following video, using FS S5850-32S2Q 10GbE switch as an example, offers a complete guide on how to use command line and GUI to access a network switch, through which you may figure out which one fits better for you. In all, the GUI provides a higher degree of multitasking and more efficiency, whereas CLI offers more control, precision and repeatability. The decision on choosing GUI vs CLI to configure the network switch should better based on user requirements. 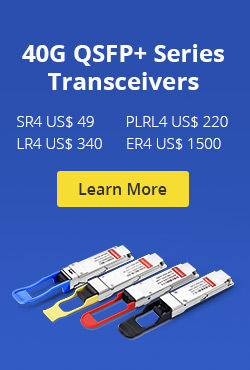 FS.COM offers a comprehensive product line of network switches, including Gigabit Ethernet switch, Gigabit PoE switch, etc. If you are seeking network switch configuration or management solutions, feel free to contact us at sales@fas.com. 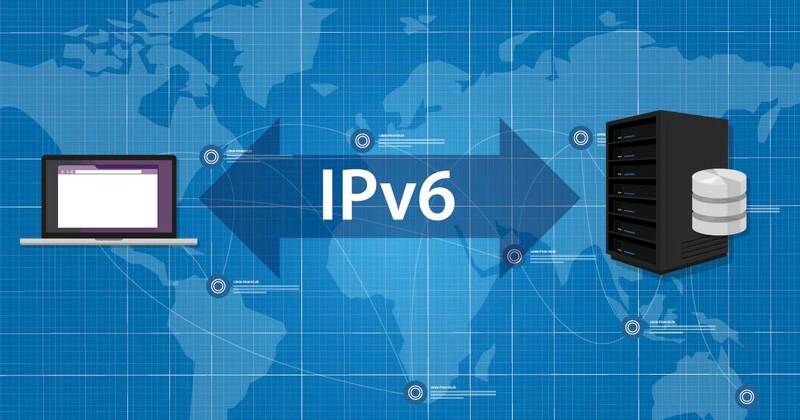 This entry was posted in Network Switches and tagged command line interface, data switch, graphical user interface, gui vs cli, network switch on September 7, 2018 by Aria Zhu. Data centers and server rooms house an abundance of server rack cabinets, which work to organize IT equipment into assembly order to make the most use of space and resources. Your daily operation and maintenance rely significantly on the server rack choice since it greatly affect the network reliability, serviceability and manageability. Not all the server racks are created equal, so we will walk you though some critical aspects for choosing the right server rack. Typically made of steel or aluminum, rails and framework, a server rack is capable of holding hundreds or even thousands of pounds of equipment. For now, the vast majority of IT applications use 19-inch server racks and equipment. As the width of which is always the same, the height and depth can be various. 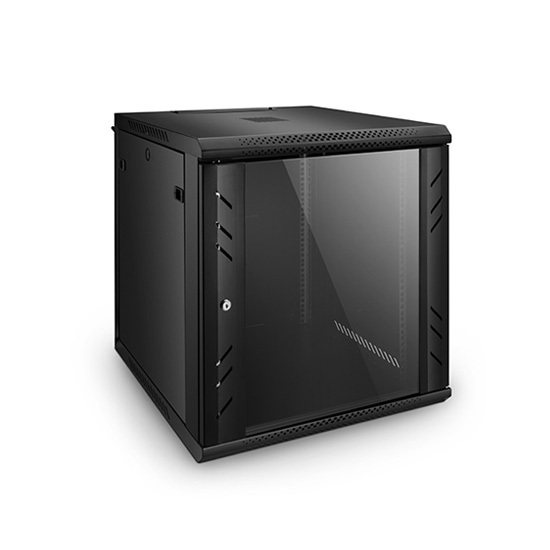 Server rack is designed to hold all standard 19-inch rack-mountable equipment, as long as it isn’t too deep for the cabinet or too high to fit in the available rack spaces. Moreover, server rack also holds IT infrastructures and rack accessories that support the operation of the production equipment, including UPS systems, PDUs, cable managers, KVM switches, patch panels and shelves. 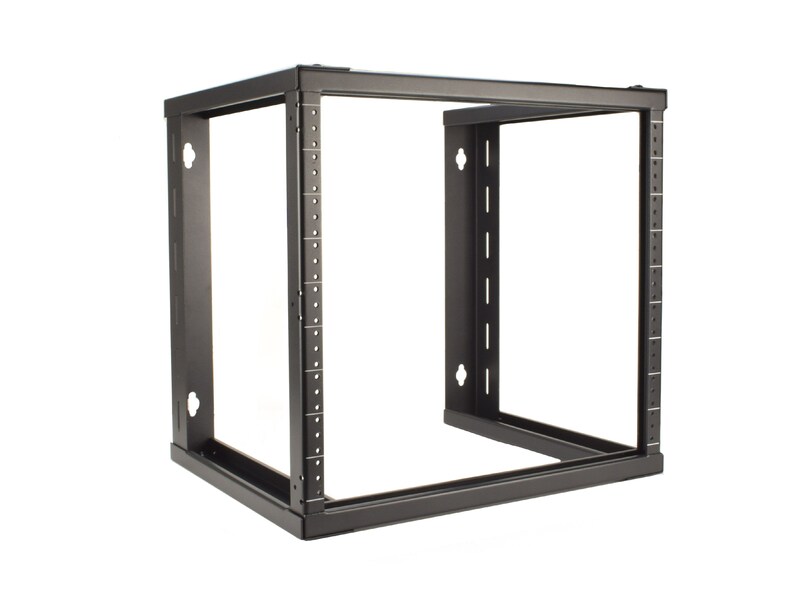 Basically, there are two types of server racks: rack enclosures (or rack cabinets) and open-frame racks. 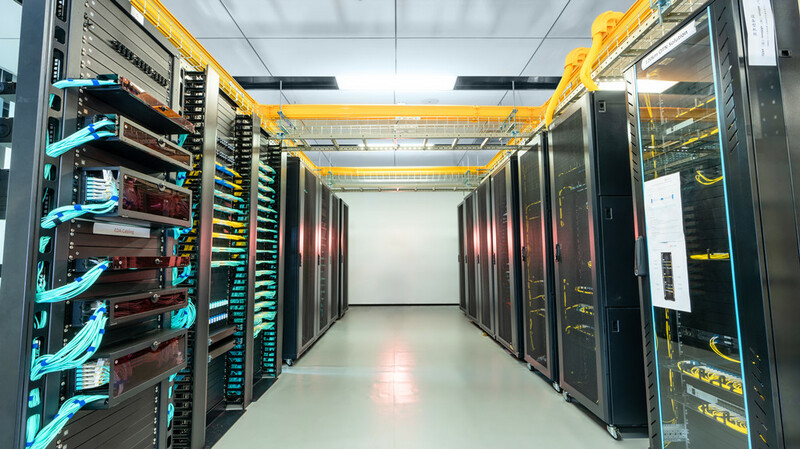 And based on where they are used, rack enclosures and open-frame racks are further divided into floor-standing server rack and wall-mount server rack. Ideal for housing IT equipment in sites with limited floor space. Also can be used as home server rack. Be sure to accurately assess the amount of rack space you need while allow for future growth. So always pay attention to the height and depth of a server rack. The height of a rack is expressed in “rack units” (a rack unit is 1.75 inches, or 44.45mm). The actual height of a 42U rack is therefore 42 x 1.75 = 73.5 inches. With 19-inches being the traditional standard for rack mounted network hardware, some vendors make custom sizes for other types of equipment. 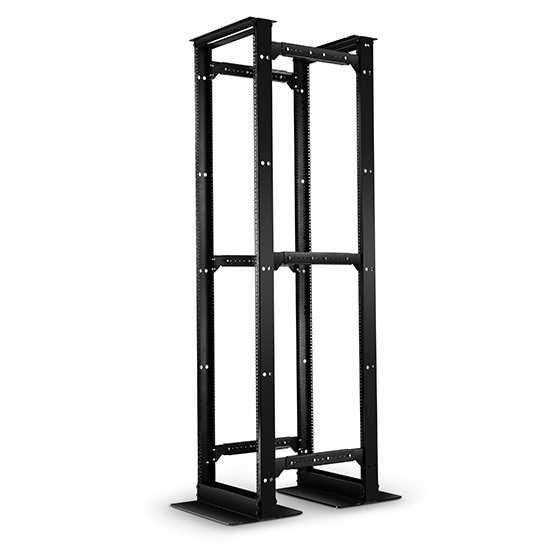 Make sure to check what size of rack your equipment requires. While there might be a great amount of expensive equipment installed on the rack, you have always to bear security in mind. A rack that meets the security goal is thus essential. Locking cabinet and tinted door glass can help protecting your network from prying eyes and hands. This entry was posted in Cable Management and tagged cable organizer, fiber optic patch panel, home server rack, server rack, server rack cabinet on August 24, 2018 by Aria Zhu. Choosing a data switch for your network can be a daunting task, given the myriads of vendors out there who are vying for providing network switches with fancy functions and feature sets. It may get more challenging when deciding which core switch and edge switch to buy: you have to make sure the switch you get is up to date so it can take advantage of latest technologies, and allows you to squeeze every last drop of performance out of the system. So, whether to choose a core switch or edge switch? Let’s go through their functions and roles within a network, and link these with you are gonna achieve, then you may find the answer. 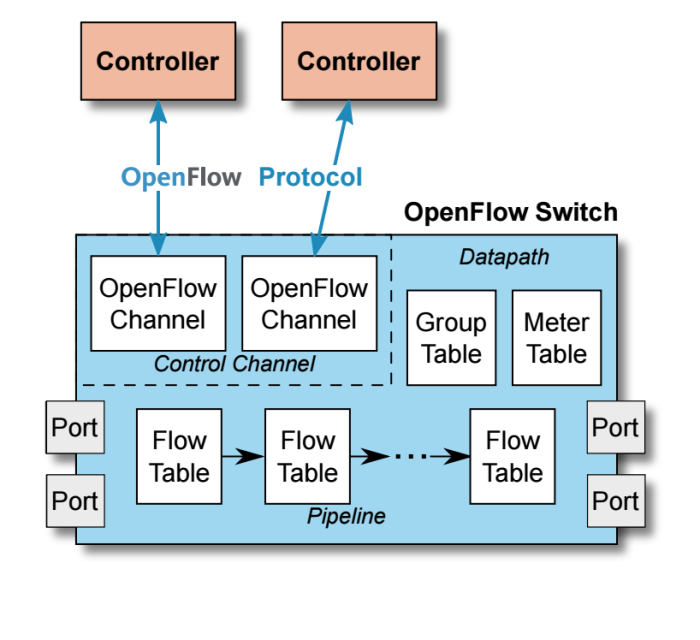 A core switch is a high-capacity switch generally positioned within the backbone or physical core of a network. 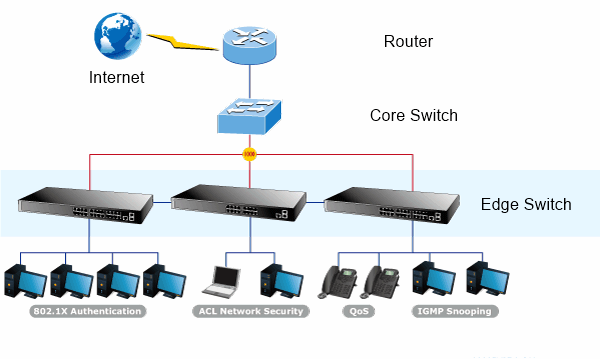 Core switch is also regarded as a backbone device that is vital to the successful operation of a network: it serves as the gateway to a wide area network (WAN) or the Internet, so that you can use it to connect to servers, your Internet service provider (ISP) via a router, and to aggregate all switches. A core switch need to be powerful enough and have significant capacity to handle the load sent to it, which means it should always be a fast, full-featured managed switch. In a public WAN, a core switch interconnects edge switches that are positioned on the edges of related networks. 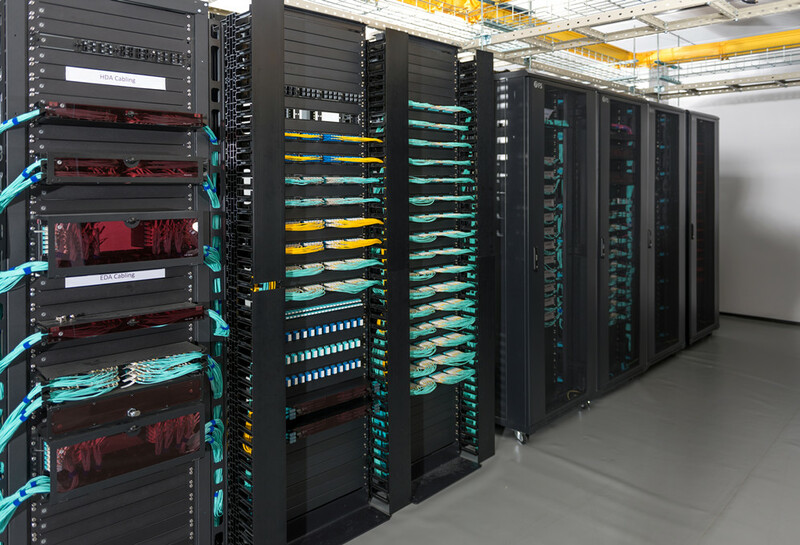 In a local area network (LAN), this switch interconnects work group switches, which are relatively low-capacity switches that are usually positioned in geographic clusters. How About an Edge Switch? As the name indicates, an edge switch is a switch located at the meeting point of two networks. 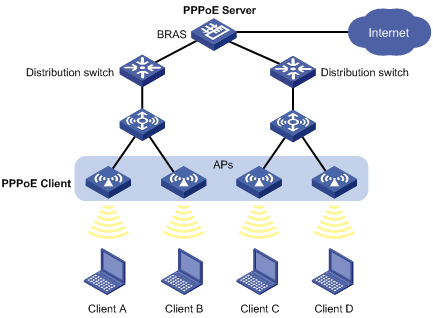 These switches connect end-user local area networks (LANs) to Internet service provider (ISP) networks. Referred to as access nodes or service nodes, an edge switch connects client devices, like laptops, desktops, security cameras, and wireless access points to your network. Edge switches for WANs are multiservice units supporting a wide variety of communication technologies, it also provides enhanced services such as virtual private networking support, VoIP and quality of service (QoS). Generally, smart switches and even unmanaged switches are valid options at the edge of your network. But for some downtime-sensitive applications or where security matters, a managed switch can also be equally used at the edge. Core Switch/Edge Switch Selection: What Exactly Matters? 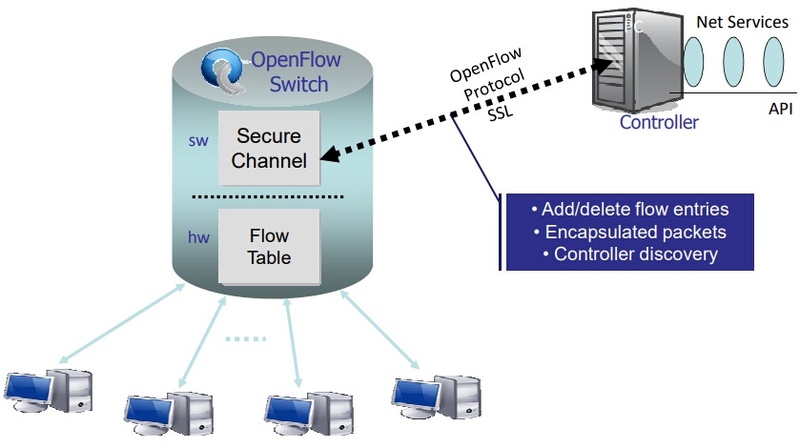 To select the appropriate switch for a layer in a particular network, you need to make clear specifications regarding current/future needs, target traffic flows and user communities. 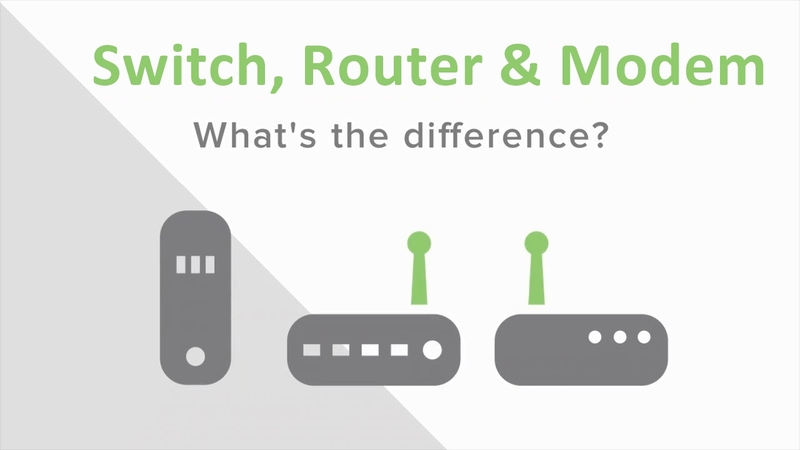 Switches comes in different sizes, features and function, choosing a switch to match a particular network involves a solid network plan for any future growth. With that in mind, you would want to purchase a switch that can accommodate more than 24 ports, such as stackable or modular switches that can scale. 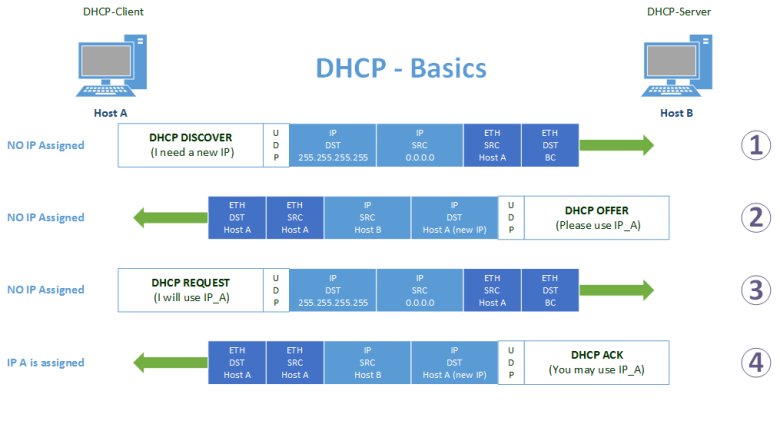 When selecting a switch for the access, distribution, or core layer, consider the ability of the switch to support the port density, forwarding rates, and bandwidth aggregation requirements of your network. An edge switch needs to support features such as port security, VLANs, Fast Ethernet/Gigabit Ethernet, PoE and link aggregation. 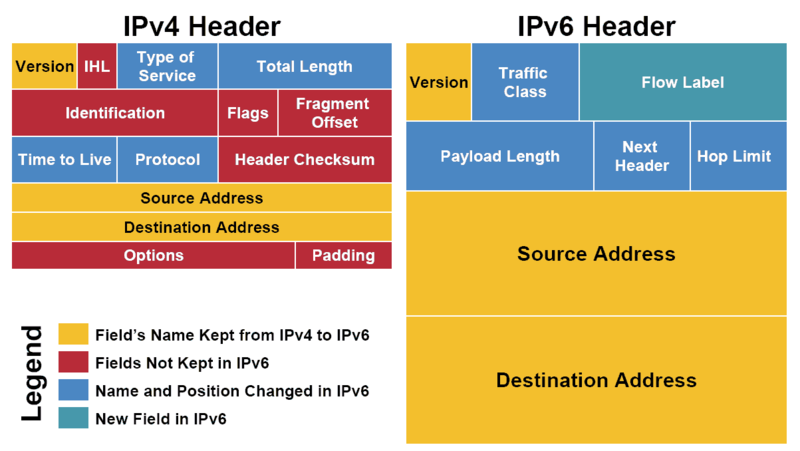 While a core switch also needs to support link aggregation to ensure adequate bandwidth coming into the core from the distribution layer switches. Also, a core switch support additional hardware redundancy features like redundant power supplies, and hot-swappable cooling fans. So there is no downtime during switch maintenance. 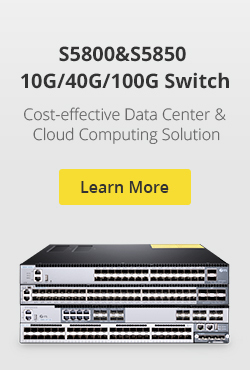 FS.COM offers a large portfolio of Ethernet switches including 10GbE switch, 25GbE switch, 40GbE switch and 100GbE switch, each with different port configurations and moderate to advanced feature sets that tailored for enterprise networks and data centers. The core switch and edge switch in FS.COM are presented as follows. All these network switches are tested with the highest industry standard in rigorous environment, for more specifications, just reach out to us via sales@fs.com. This entry was posted in Network Switches and tagged 10g network switch, 10GbE switch, core switch, data switch, edge switch on July 7, 2018 by Aria Zhu.